Trump’s Rhetoric Echoes Nazi Germany, Beto O’Rourke Says, Accurately, The Intercept, Robert Mackey, Friday, 5 April 2019: “President Donald Trump’s defenders professed outrage on Friday at comments from Beto O’Rourke, a Democratic presidential candidate, who accurately observed that the president’s rhetoric on immigrants would not have been out of place in Nazi Germany. Speaking at two campaign events in Iowa, O’Rourke said that Trump’s policy of separating the children of asylum-seekers from their parents as they cross the border, ‘follows the rhetoric of a president who not only describes immigrants as rapists and criminals, but as animals and an infestation. Now, I might expect someone to describe another human being as an infestation in the Third Reich,’ O’Rourke told students at Morningside College in Sioux City. ‘I would not expect it in the United States of America.’ Last year, Trump told reporters that the deportation of undocumented immigrants was necessary because ‘you wouldn’t believe how bad these people are — these aren’t people, these are animals.’ A month later, the president tweeted that Democrats ‘want illegal immigrants, no matter how bad they may be, to pour into and infest our Country, like MS-13.’ Last week, Trump mocked the claims of asylum-seekers who claimed their lives were at risk as ‘a big, fat con job.’… ‘Calling human beings an infestation is something that we might’ve expected to hear in Nazi Germany,’ he continued. ‘Describing immigrants — who have a track record of committing violent crimes at a lower rate than native-born Americans — as rapists and criminals. Seeking to ban all Muslims — all people of one religion — what other country on the face of the planet does that kind of thing? Or in our human history or in the history of the Western world? ‘Putting kids in cages?’ O’Rourke added. ‘Saying that neo-Nazis and Klansmen and white supremacists are very fine people? You draw your own conclusions, but this is not something that I expected to hear a president of the United States of America ever say. '” See also, Beto O’Rourke compares Trump’s rhetoric on immigration to that of Nazi Germany, The Washington Post, Holly Bailey and John Wagner, Friday, 5 April 2019: “‘If we don’t call out racism, certainly at the highest levels of power, in this position of trust that the president enjoys, then we are going to continue to get its consequences,’ O’Rourke said. ‘Silence is complicity in what this administration is doing, so let’s call it out. Let’s also define a better future for this country, and that’s what I’ve been trying to do in this campaign. '” See also, Beto O’Rourke: Trump’s rhetoric ‘is something that we might have expected to hear in Nazi Germany,’ CNN, Donald Judd, Friday, 5 April 2019. 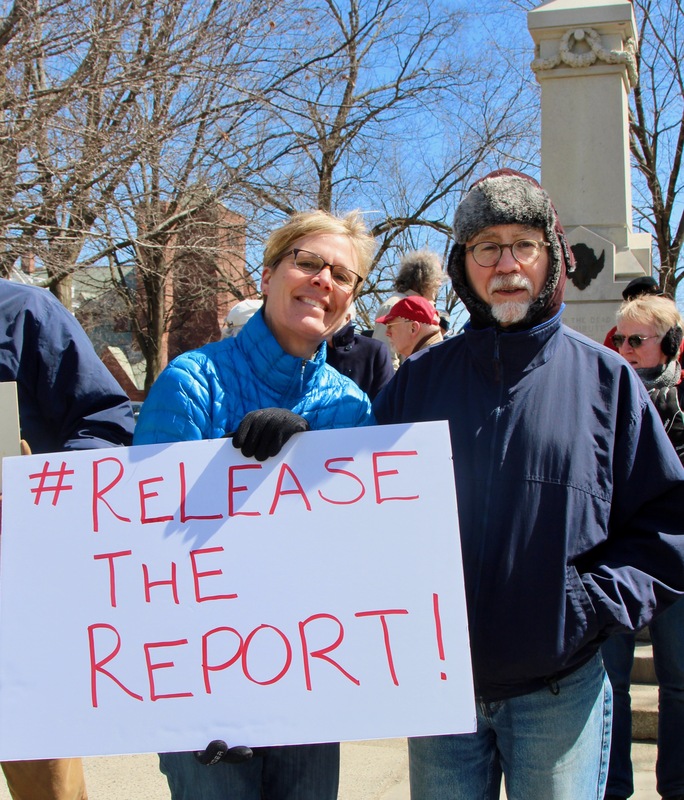 Treasury Department Declines to Immediately Comply With House Request for Trump’s Tax Returns, The New York Times, Alan Rappeport, Wednesday, 10 April 2019: “The Treasury Department said on Wednesday evening that it would not immediately comply with a congressional request to hand over President Trump’s tax returns, setting up a protracted legal battle between two branches of government. Steven Mnuchin, the Treasury secretary, said in a letter to Representative Richard E. Neal, the Democratic chairman of the House Ways and Means Committee, that the Treasury Department’s lawyers needed more time to assess the lawfulness of the request and expressed concern that it would be a violation of taxpayer privacy…. Mr. Neal responded to Mr. Mnuchin’s decision with a terse statement that indicated he believed the request was a matter for the Internal Revenue Service, not the Treasury secretary: ‘I will consult with counsel and determine the appropriate response to the commissioner in the coming days.’ Mr. Neal is expected to send a follow-up letter demanding the tax returns and outlining potential next steps, which could include a subpoena or a lawsuit. The issue could ultimately be decided by the Supreme Court.” See also, Treasury Department says it will miss House Democrats’ deadline for turning over Trump’s tax returns and casts skepticism over request, The Washington Post, Jeff Stein and Damian Paletta, Wednesday, 10 April 2019: “Treasury Secretary Steven Mnuchin said his department would not meet the Wednesday deadline set by congressional Democrats to turn over copies of President Trump’s tax returns, escalating a clash between the White House and Congress. Mnuchin said he was consulting with the Justice Department as to the constitutional questions raised by the Democrats’ request and appeared deeply skeptical of the lawmakers’ intentions. He did not flatly reject the notion that he might ultimately comply, but his letter to the House Ways and Means Committee suggested that Mnuchin would not hold himself to any timeline.” See also, Steven Mnuchin Says the Treasury Department Won’t Meet the Wednesday Deadline for Trump’s Tax Returns, The Wall Street Journal, Richard Rubin, Wednesday, 10 April 2019. Net neutrality bill sails through the House but faces an uncertain political future, The Washington Post, Tony Romm and Brian Fung, Wednesday, 10 April 2019: “House lawmakers on Wednesday approved a Democrat-backed bill that would restore rules requiring AT&T, Verizon and other Internet providers to treat all Web traffic equally, marking an early step toward reversing one of the most significant deregulatory moves of the Trump era. But the net neutrality measure is likely to stall from here, given strong Republican opposition in the GOP-controlled Senate and the White House, where aides to President Trump this week recommended that he veto the legislation if it ever reaches his desk. The House’s proposal, which passed by a vote of 232-190, would reinstate federal regulations that had banned AT&T, Verizon and other broadband providers from blocking or slowing down customers’ access to websites. Adopted in 2015 during the Obama administration, these net neutrality protections had the backing of tech giants and startups as well as consumer advocacy groups, which together argued that strong federal open Internet protections were necessary to preserve competition and allow consumers unfettered access to movies, music and other content of their choice.” See also, House Democrats’ net neutrality legislation is likely DOA in the Senate, but it is poised to become an issue in 2020, Politico, John Hendel, Wednesday, 10 April 2019. White House proposed releasing immigrant detainees in sanctuary cities to retaliate against Trump’s political adversaries, The Washington Post, Rachael Bade and Nick Miroff, Thursday, 11 April 2019: “White House officials have tried to pressure U.S. immigration authorities to release detainees onto the streets of ‘sanctuary cities’ to retaliate against President Trump’s political adversaries, according to Department of Homeland Security officials and email messages reviewed by The Washington Post. Trump administration officials have proposed transporting detained immigrants to sanctuary cities at least twice in the past six months — once in November, as a migrant caravan approached the U.S. southern border, and again in February, amid a standoff with Democrats over funding for Trump’s border wall. House Speaker Nancy Pelosi’s district in San Francisco was among those the White House wanted to target, according to DHS officials. The administration also considered releasing detainees in other Democratic strongholds…. The attempt at political retribution raised alarm within ICE, with a top official responding that it was rife with budgetary and liability concerns, and noting that ‘there are PR risks as well.’… Pelosi’s office blasted the plan. ‘The extent of this administration’s cynicism and cruelty cannot be overstated,’ said Pelosi spokeswoman Ashley Etienne. ‘Using human beings — including little children — as pawns in their warped game to perpetuate fear and demonize immigrants is despicable. '” See also, White House Considered Releasing Migrants in ‘Sanctuary Cities,’ The New York Times, Michael D. Shear and Zolan Kanno-Youngs, Thursday, 11 April 2019. Senate confirms former oil and gas lobbyist David Bernhardt as interior secretary, The Washington Post, Darryl Fears, Thursday, 11 April 2019: “Former oil and gas lobbyist David Bernhardt was confirmed by the Senate on Thursday to lead the Interior Department, an agency that controls nearly half a billion acres of public land and the vast amount of oil and gas mineral resources resting beneath it…. [H]is work as a lobbyist for the oil and gas industry in the West, as well as large water utilities, led to concerns about conflicts of interest. The Interior Department oversees 700 million acres of minerals and other resources underground and 1.7 billion acres offshore. The department works closely with some of Bernhardt’s former clients.” See also, Senate Confirms David Bernhardt as Interior Secretary Amid Calls for Investigations Into His Conduct, The New York Times, Coral Davenport, Thursday, 11 April 2019: “The Senate on Thursday voted to confirm David Bernhardt, a former lobbyist for the oil and agribusiness industries, as secretary of the interior. The confirmation of Mr. Bernhardt to his new post coincided with calls from more than a dozen Democrats and government watchdogs for formal investigations into his past conduct.” See also, Senate confirms David Bernhardt to head the Interior Department, Anthony Adragna, Politico, Thursday, 11 April 2019. A ‘pure racist act’: N.Y. Post slammed for using 9/11 to attack Representative Omar over speech on Islamophobia, The Washington Post, Eli Rosenberg, Thursday, 11 April 2019: “The cover of the New York Post on Thursday showed an image of the World Trade Center exploding into flames on Sept. 11, more than 17 years ago. The target of the tabloid’s ire? Rep. Ilhan Omar, one of the first two Muslim women to serve in Congress, who has become a frequent target of criticism, harassment and outright Islamophobia from the right wing since her election in November. Omar (D-Minn.) had made brief remarks about Islamophobia at an event in March that came in the aftermath of the white-supremacist shooting that left 50 Muslim worshipers dead in New Zealand. But after video of the event was published this week, conservative figureheads fixated on the way she had phrased a reference to 9/11, as ‘some people did something.’ The New York Post took the controversy, which had percolated for days in conservative circles, and amplified it by splashing it across its cover Thursday with a photo of the twin towers. The decision touched off a storm of indignation and anger among liberal commentators online. Many felt the newspaper, which has a history of incendiary front pages, had overstepped the bounds of acceptability. Others said they thought that the cover amounted to incitement of violence against Omar, who has faced a growing number of threats.” See also, The New York Post’s Craven Ilhan Omar Cover Was an Insult to All New Yorkers, GQ, Elizabeth Spiers, published on 12 April 2019. Former F.B.I. Director James Comey Defends Surveillance of the Trump Campaign: ‘I Have Never Thought of That as Spying,’ The New York Times, Zolan Kanno-Youngs and Michael S. Schmidt, Thursday, 11 April 2019: “The former F.B.I. director James B. Comey said on Thursday that he knew of no electronic surveillance aimed at the Trump campaign during the 2016 presidential election, defending the bureau after Attorney General William P. Barr asserted a day earlier that the bureau spied on the campaign as part of the Russia investigation. ‘When I hear that kind of language used, it’s concerning because the F.B.I., the Department of Justice conduct court-ordered electronic surveillance,’ said Mr. Comey, who oversaw the inquiry until President Trump abruptly fired him in May 2017. ‘I have never thought of that as spying.’ Mr. Barr said in congressional testimony on Wednesday that the bureau might have taken improper measures while investigating links between Mr. Trump’s campaign and Russia, describing the F.B.I.’s conduct as ‘spying,’ a term typically associated with unlawful surveillance.” See also, James Comey says he’s more worried about Trump than about Russian disinformation campaigns, The Washington Post, James Hohmann, published on 12 April 2019.